Real estate is everything. The resort is located on 650 feet of gorgeous beachfront property. Enjoy a tasty beverage at Melon Head's Tiki Bar. Or check out the lunch menu for a bite by the beach. Enjoy great ocean views while you show off your expert burger-flipping skills. The resort is located on over 650 feet of gorgeous beach. Work on perfecting your swing at Holiday Golf Club, a 6 minute drive from the resort. Gulf World Marine Park is a 7 minute walk from the resort. Get ready to swim with the dolphins. Osprey on the Gulf is TripAdvisors #1 Hotel in Panama City Beach and received their Certificate of Excellence. The laid-back atmosphere of the resort allows you to indulge in days full of “want to’s” instead of the usual “have to’s” – and having access to 650 feet of gorgeous beach definitely doesn’t hurt. It’s a setting so scenic, you’ll want to snap some family pics (your Instagram followers will be so jealous). The resort has three pools. Get everybody sun-screened up and pick one. The kiddos will want to spend hours in the outdoor pools. They’ll be so happy that you’ll wonder if they’re part fish. Grab a chair, order a mai tai and get comfortable. You’re going to be here for awhile. The kiddie splash pad will leave them nothing short of giddy. The outdoor grills await your expert steak or burger-flipping skills. Recruit the kids to help carry side dishes and condiments and let everyone have at it. Let the kids go wild on the outdoor playground while you enjoy a refreshing drink at Melon Head’s Tiki Bar. Spacious studio and one-bedroom condos sleep from two to six guests. Kitchens have full-size refrigerators with enough room for everyone’s favorites. And freezers are perfect for storing dessert – popsicles for the kids (and a secret gelato stash for the grown-ups). Visit the onsite convenience store for groceries. Every suite has a flat screen TV with cable service, so you don’t have to worry about missing your favorite show or the big game. Daily housekeeping means more time with the kids and less time tidying up. Relax with a good book and a cocktail while you enjoy the gorgeous view from your private balcony. 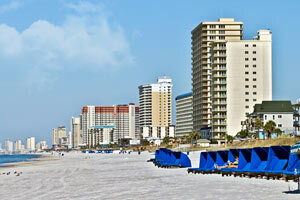 Take advantage of the resort’s fantastic location and spend the day on the beach. Or surprise the kids with a trip to Coconut Creek Family Fun Park. They have two eighteen hole mini golf courses that are just waiting to be tackled or test out your navigational skills at the Grand Maze. Gather the golfers in your crew and head to Holiday Golf Club down the road. Animal lovers? Visit Gulf World Marine Park. It’s only a seven-minute walk from the resort. Shark and Turtle feedings are twice a day, and Stingrays are fed four times a day. Swim with the dolphins or check out the Bottlenose Dolphin Show. Grownups will love happy hour at Jimmy Buffett’s Margaritaville restaurant and bar - every weeknight from 4:00 PM to 7:00 PM! - Kids stay free! Up to 3 children 15 years old and younger stay free when using existing bedding. This property requires all guests to be 25 years of age, with exceptions made for minors accompanied by parents. For more details on age restrictions and required deposits, please contact the office using the information on the reservation confirmation received after booking.